This post, the fifth in a series on exhibits at Harvard University's Peabody Museum of Archaeology and Ethnology, highlights more canoe-related items from North America's Pacific Northwest. 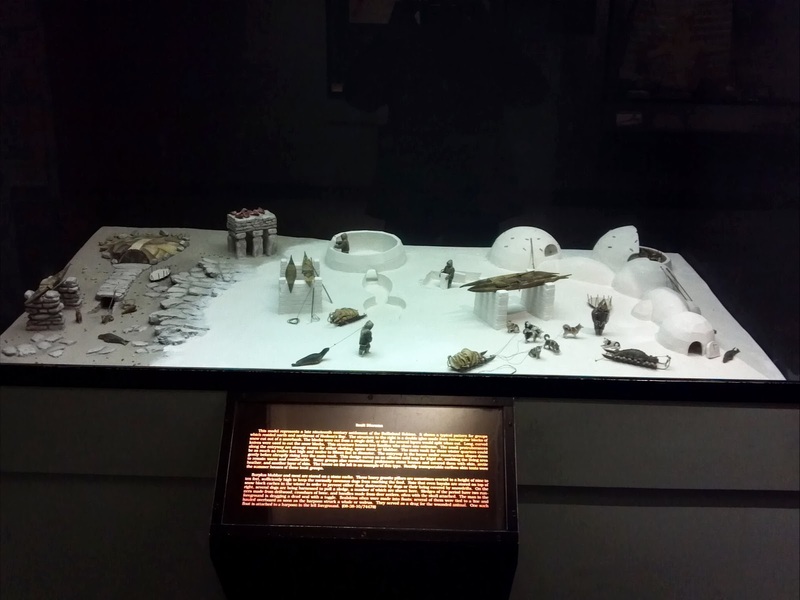 Earlier, the series looked at Baffinland Inuit, Aleut, other Alaskan Eskimo, and other Pacific Northwest exhibits. Quotations in the photo captions are from the exhibit display cards. 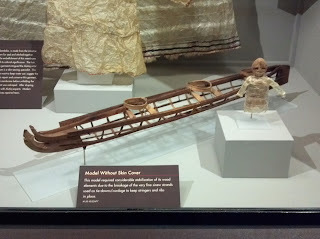 Tlingit or Haida canoe model, collected about 1849. Both groups traditionally lived around the present-day border between British Columbia and Alaksa. "The style of this vessel is called a 'head canoe.' It is only known from models, since it went out of fashion in the early nineteenth centry. 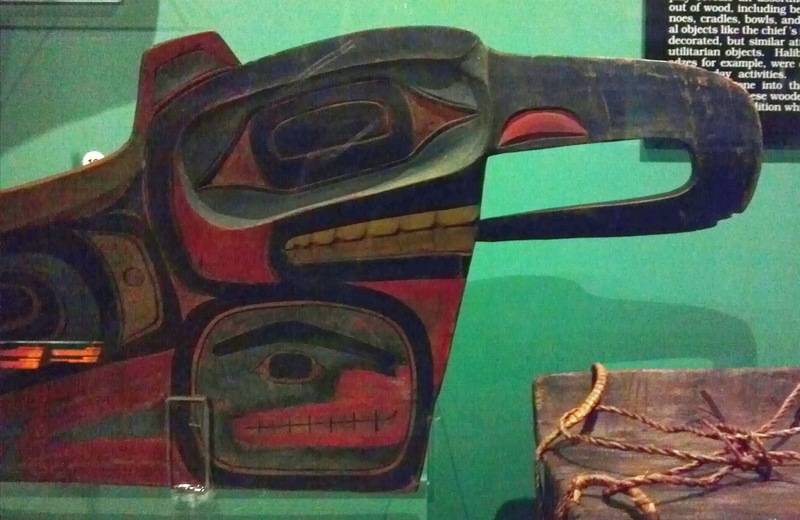 This model is probably made of yellow cedar and has an unsual beak, perhaps relating to a Thunderbird, although it could signify any of a number of creatures. The rest of the design is also ambiguous." Detail of the bow of the head canoe in the previous photo, showing two "head" images, one painted, the other painted and carved. Hand adze from the Quinault group of the Coast Salish people of western Washington state. "The adze is a principal wood-working tool among Northwest Coast Indians. Traditionally the blade was made of stone, but steel substituted in the eighteenth century. The handles of these tools, however, show strong continuities in form and decoration through time. 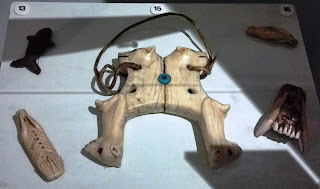 The handle of this D-shaped adze is carved out of whalebone, while the blade is cut down from a small ax head. The lashings may be of twisted whale or sea lion sinew....(P)robably dates to the early nineteenth century." Canoe bailer from the Clayoquot region of British Columbia, collected before 1905. "Bailers of square form were common among the Westcoast Indians... It once had attached to it a handle of twisted cedar withes." Left: Canoe paddle, yew wood, collected in Nootka Sound, 1794. "Standard Westcoast features include the delicate form of the blade, the square cross-section of the grip, and the separately carved handle attached by pegs. The surface of the paddle is blackened with pitch and oil. 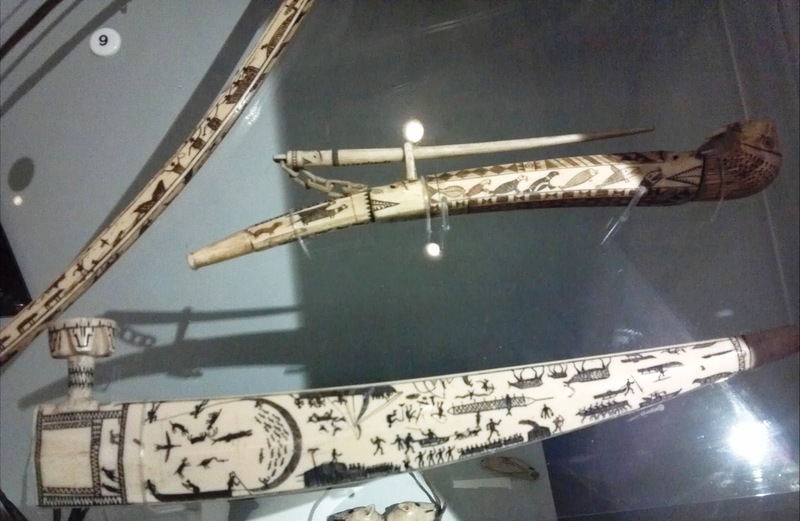 A wrapping of kelp...served as both a grip as well as a pad where the paddle rubbed against the gunwales...." Center and right: Bow, quiver, and arrow; either Yakutat Tlingit or Chugach Eskimo, prior to 1905. Sea otters remained abundant in Tlingit country in the 19th century, after they had been virtually exterminated in other areas of the Pacific Northwest. Although guns were in common use there, "(b)ows and arrows continued to be used for hunting sea otter, because of their silence. One gunshot would scatter a herd." 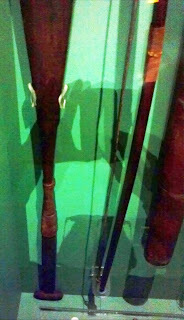 Details of the grips of the paddle and bow in the previous photo. Three Nuu-chah-nulth dugout canoes gather around a whale kill. Probably all three helped tow the carcass into shore after it had died from multiple harpoon wounds. 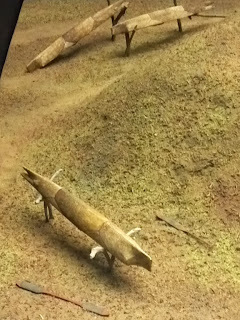 With their clear head and tail, the canoes' overall shape is zoomorphic, i.e., shaped to depict or imitate an animal. A close-up of one of the whaling canoes and its associated gear. 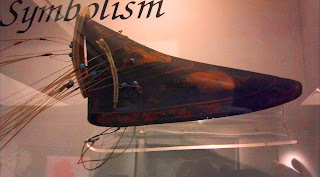 In the bow is a coiled line attached to a triangular piece of wood, the purpose of which I don't know. (Help please, readers.) Moving aft, there's a square wooden box, an inflated skin float, three paddles with lanceolate blades and T-grips, and atop it all a very large harpoon, with the head separated from the shaft and attached to a line. To the right, the whale shows multiple harpoon wounds, and several floats are still attached by lines to embedded harpoon heads. Another canoe close-up, with the harpoon head attached to the shaft, and several paddles. 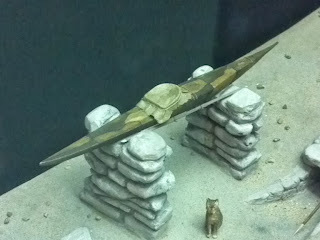 The canoes were built of a single hollowed log which was "expanded" to increase the beam. In this process, the hollowed log was filled with water; fire-heated stones were placed inside until the water boiled; as they cooled, stones were regularly replaced with newly heated ones to keep the water temperature high; when the wood had softened sufficiently, thwarts were forced between the gunwales to force the sides apart. This would commonly add some rocker to the hull. 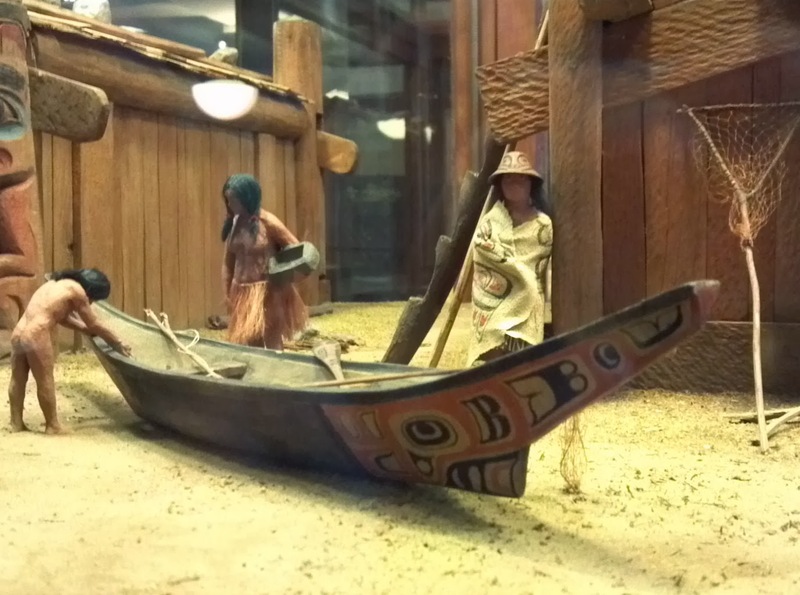 Moving on to another Pacific Northwest culture: the traditional home of the Haida people was coastal northern British Columbia and southern Alaska. 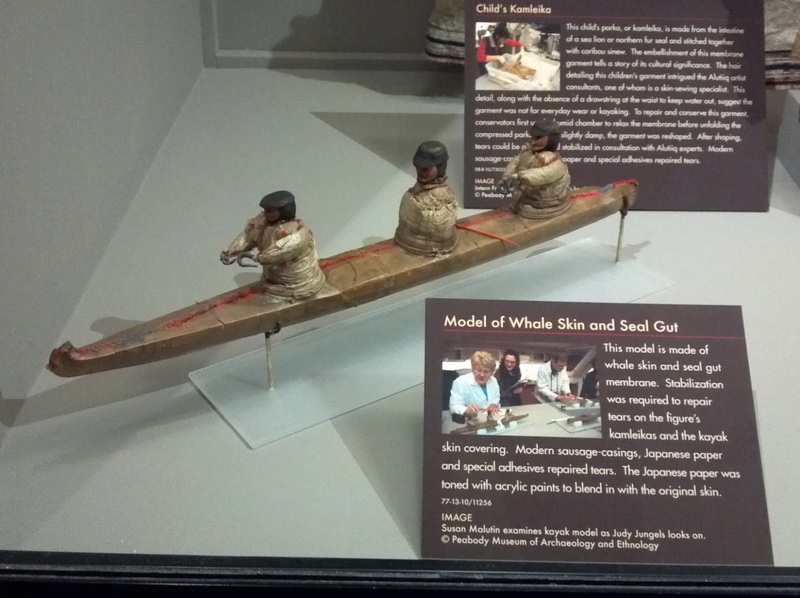 The basic canoe-building process was the same as that of the Nuu-chah-nulth, but the boats exhibit striking differences. Most notable is the forward skeg: the boat's bow is to the right, and what appears to be a conventional stern skeg is actually a kind of cutwater. This is a fishing canoe. In the stern is what appears to be a leister, a fish spear whose head has a central point on which the fish is impaled, and two prongs on either side that prevent it from escaping. In the bow is a long-handled dip net. The decorated paddles have broad, rounded blades somewhat like beavertails, and a grip reminiscent of the Maine Northwoods style. The woman immediately behind the canoe holds a box that appears to be carved from a solid block of wood. The person to her left wears a bentwood hat. Close-up of the same canoe, showing details of painted decoration and the bow skeg. At extreme right, a dip net of a different pattern rests against the house wall. The houses display massive timber perimeter framing. 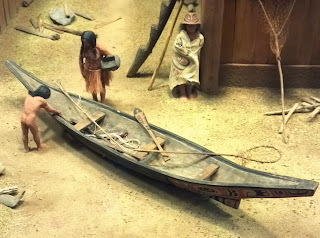 The traditional range of the Kwakwa̱ka̱’wakw people (formerly and incorrectly known as the Kwakiutl, who were actually just one of the tribes of the Kwakwa̱ka̱’wakw culture) was northern Vancouver Island and the nearby mainland and smaller islands. From the exhibit's display card: "As with most Northwest Coast tribes, Kwakiutl villages are found along the shoreline. This is because the sea traditionally furnished their principal foods, including various species of fish, sea mammals, and molluscs. A memorial pole stands before two permanent houses in this scene. Prior to the introduction of commercial lumber, the Kwakiutl made boards of split planks of red cedar. 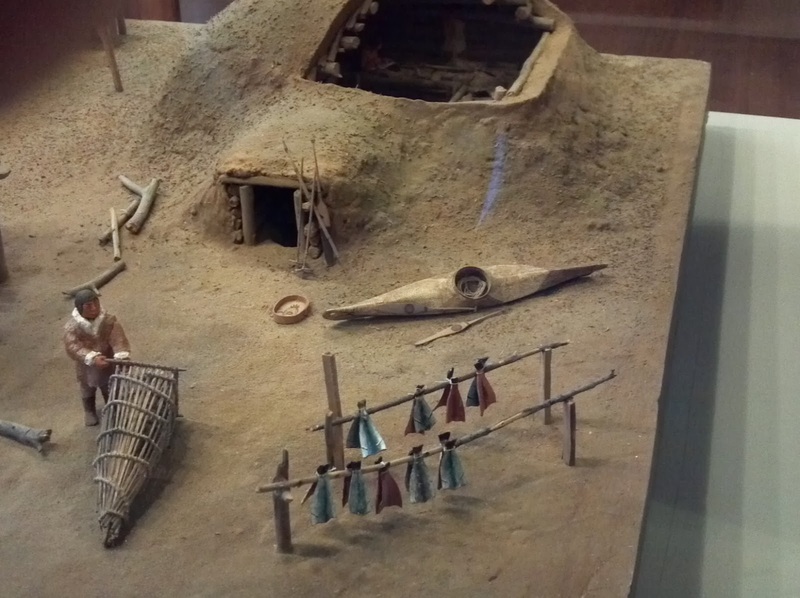 This wood was of particular importance to these Indians for many items of manufacture. The completed house has an elaborate design on its front which identifies the crests of the family. The framework for these houses consists of heavy beams and posts, all of which were carved and notched prior to raising. The roof boards are split so that their edges turn up. When placed on the rafter, the lower boards are set concave side up so that they serve as gutters. Heavy stones are set on one of these roofs as an added precaution to keep the planks from blowing off during inclement weather." 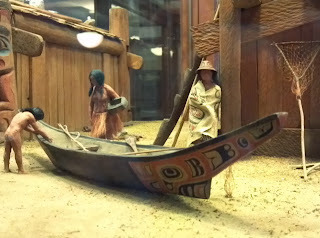 Close-up of a Kwakwaka'wakw dugout canoe with leister and paddle. This top view shows a hull that is symmetrical fore-and-aft, including the end decorations. The paddle has a long, narrow, rounded blade and an elaborate form of T-grip. 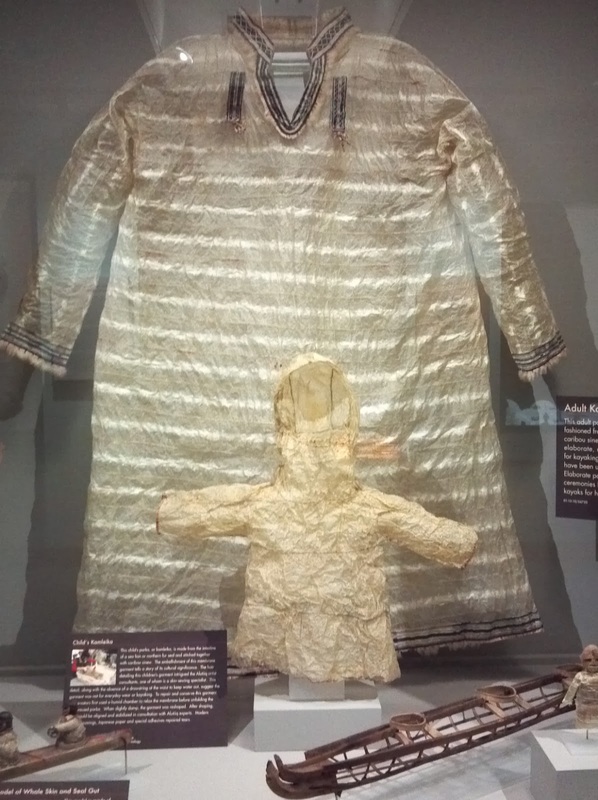 Let's look at more Aleut and other Alaskan Eskimo maritime and related cultural items at Harvard University's Peabody Museum of Archaeology and Ethnology. 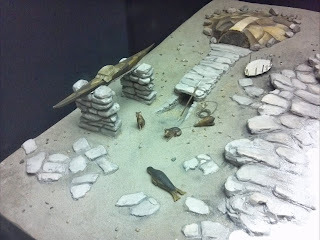 (See previous posts on the museum's Baffinland Inuit and other Aleut exhibits.) All quotations are from exhibit display cards. 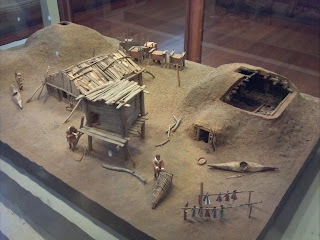 Close-up of the diorama's right side. At left is a man with a fish trap. To his right are drying racks for split fish, likely cod or halibut. A paddle on the ground beside the kayak has a single blade of an unusual shape. The Yupik kayak as shown in Adney & Chappelle's The Bark Canoes and Skin Boats of North America. As Harvey Golden notes, "the scale drawings of these types make them look massive and blocky, but as the model shows, they are rather elegant craft." Harvey has built a wonderful replica of this kayak, and he reports that another is near completion. 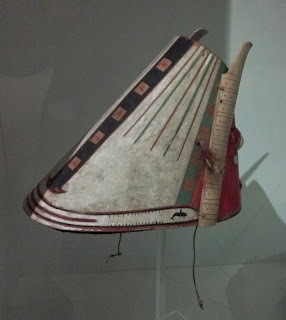 Man's hat, typical of the Aleutians and southwest Alaska, early 19th century. "The caribou effigies at the top of the ivory wing pieces are unusual, because sea hunting equipment rarely depicts land animals." A wooden helmet from Kodiak Island, collection before 1869. This was worn on top of the head when hunting seals on the sea ice. Hunters would typically hide behind rocks or ice blocks, peering carefully while disguised as a seal and awaiting the moment when a real seal was far enough from open water to dash out of cover and make the kill with either a spear or a club. 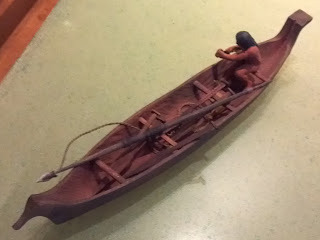 Model of a three-hole kayak, similar to those in the previous post. The bow paddler wears a gutskin paddling jacket and a decorated bentwood hat topped with a bird effigy -- possibly a sign of status. The other men wear wooden visors. The man in the center cockpit is about to hurl a harpoon with a throwing board. Upper left: whale amulet, stone, Point Barrow, prior to 1894. Lower left: sea otter amulet, walrus ivory. "It was probably tied to the inside of a kayak rim where it improved the fortune of the hunter. Bristol Bay or Aleutian region, prior to 1867. Center: Whaling harpoon rest from north Alaska. "The large heads carved out of walrus ivory are polar bears, while the smaller ones are either white fox or, possibly, sea otter. 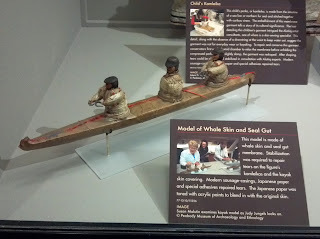 The wide U-shaped opening rested on the gunwales of an umiak during the whale hunt, so only the small inoffensive animals could be 'seen' by the whales. Early 19th century. Upper right: ivory toggle in the shape of a seal: possibly a clothing fastener. Collected on Norton Sound prior to 1888. Lower right: amulet of a bear jaw: probably carried for protection when hunting bear. A floating seal lure, collected prior to 1894. 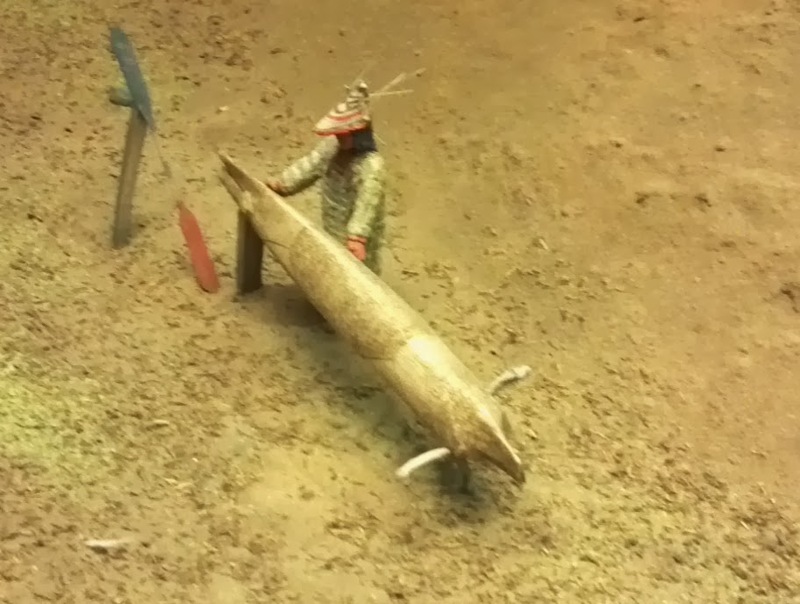 "This sea mammal effigy is made out of wood and fossil ivory. It rattled when it bobbed around in the water, thus attracting a seal.... (It) was collected at Point Barrow, but it is more ornate than what is usually found in that area." Two tobacco pipes of walrus ivory. 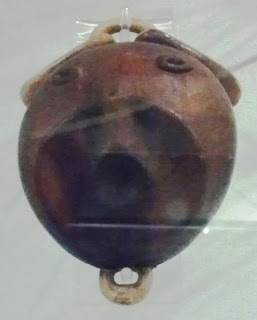 The bowl of the upper one is in the form of a walrus's head (lying on its back, facing upward), and the spike attached by a carved chain of ivory is a probably representational, not functional, pipe cleaner. Both show many incised carvings of sea mammals, birds, game, hunting scenes, fish and fishing, and umiaks. On the upper edge of the lower pipe, about halfway between bowl and mouthpiece and shown upside-down, is a boat (probably an umiak) with a mast supporting a mainsail and topsail. 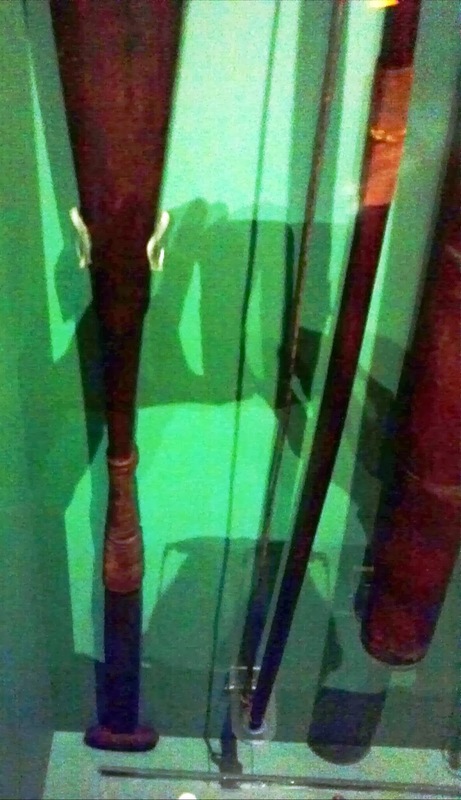 Partially visible in the upper left is an ivory bow from a bow drill collected mid-19th century from Norton Sound and almost certainly nonfunctional. All of these were probably produced for sale to outsiders. Here's a look at a display of Alaskan, and specifically Aleut, items at Harvard's Peabody Museum of Archaeology and Ethnology. (We previously blogged about the Peabody's fine diorama of a Baffinland Inuit settlement.) 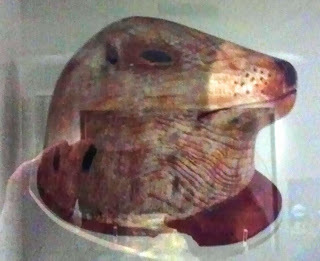 I apologize for the quality of the photography, which was shot on my mobile phone, through glass, without a flash. 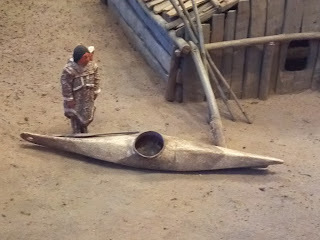 To the diorama's right of center, a man works on his overturned kayak, of a type typical of Kodiak Island and displaying the distinctive Aleut stern. 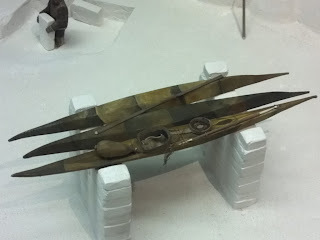 His double-bladed paddle is much shorter than the Eastern Inuit paddle shown in the previous post, and the blades are broader. The function of the different colors of the two blades is, I presume, purely decorative. The man in the previous photo wears a paddling hat much like this one, collected in 1867 or '68. To quote the display card: "This hat is an effigy of some unknown creature. It is made of bent wood (probably spruce) and held together using baleen stitches. The wing ornaments are made of bone, and there are attachments of fur, feathers, and multicolored thread....The red flannel once held sea-lion whiskers." 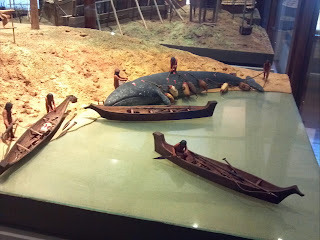 The kayak at the diorama's center shows a full complement of deck gear, including paddle, harpoon, possibly a throwing stick (i.e., atl atl) and what I believe are javelins on the aft deck. 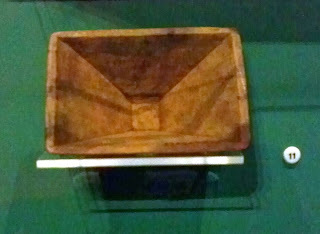 A bent-wood box is also seen. Kayaks are stored fairly low off the ground on wood supports. Unlike the Baffinland Inuit, the Kodiak Island Aleuts had no dogs from which they needed to protect the boats' skin covers. Model of an Kodiak Island 3-hole kayak. 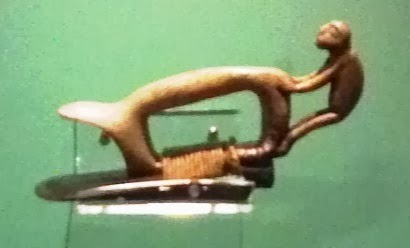 The three-person baidarka came into use after the coming of Russian fur traders, who typically sat in the center cockpit and did not paddle. Model showing the frame of a three-hole kayak similar to the one above, displaying the distinctive bifurcated stem and vertical sternpost. The kayak is very roomy, suitable for carrying large cargoes of fur -- especially of the favored sea otter. From the display card: "This adult parka, or kamleika, is fashioned from seal intestine sewn with caribou sinew. The parka's detail is elaborate, and it lacks a drawstring for kayaking, which suggests it may have been used for a special occasion. Elaborate parkas were used in dance ceremonies before launching kayaks for hunting trips." The small child's kamleika features details of hair of a type unspecified, and also lacks a drawstring. Because strips of intestine are so narrow, a great deal of sewing was required to produce garments of this type. If the kamleika was intended for kayaking, not show, that sewing must have required the most painstaking effort to ensure water-tightness. 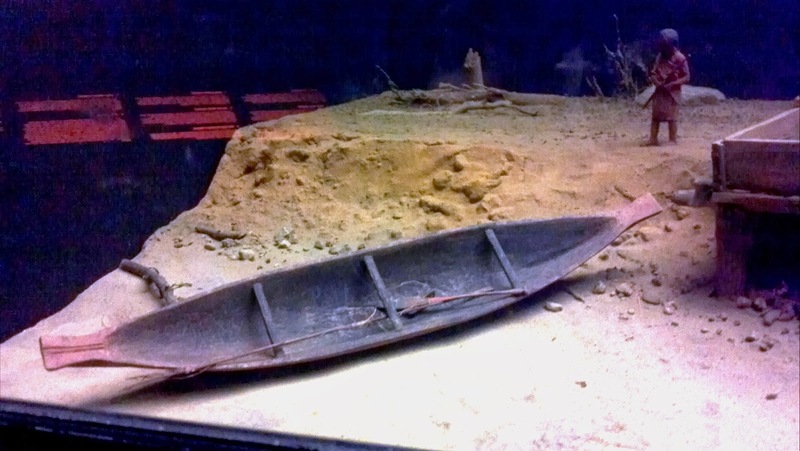 This is the first of several planned posts featuring boat-related displays at the Peabody Museum of Archaeology and Ethnology at Harvard University. This post focuses on a single diorama of a late 19th-century Eskimo (Inuit) settlement in Baffinland, typical of the culture north and northwest of Hudson's Bay. As this was a distinctly maritime culture, I feel it's appropriate to include discussion of some elements that are not strictly boat-related, such as their housing arrangements. 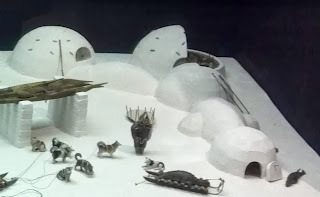 The Baffinland Eskimo diorama at the Peabody Museum, Harvard University (click any image to enlarge). The left side of diorama shows the settlement in summer, with the ground bare of snow. In the background is a semi-subterranean, prehistoric dwelling that has been reconditioned for re-use with a covering consisting of two layers of skin, with a layer of heather in between as insulation. Rocks hold the skin against the ground. Note the long, narrow, stone-covered trench entryway. Near the entry is an inflated sealskin float attached by a long line to a harpoon. When an Eskimo succeeded in harpooning a seal, sea lion, walrus or whale, the float slowed the prey's flight, served as a marker for its location, and prevented it from diving deeply (thus making it an easier target for additional harpoon strikes), or sinking when it died. Closeup of the previous scene: When not in use during the summer, kayaks were stored well aboveground on stone pillars, to protect their covers from being eaten by hungry dogs. 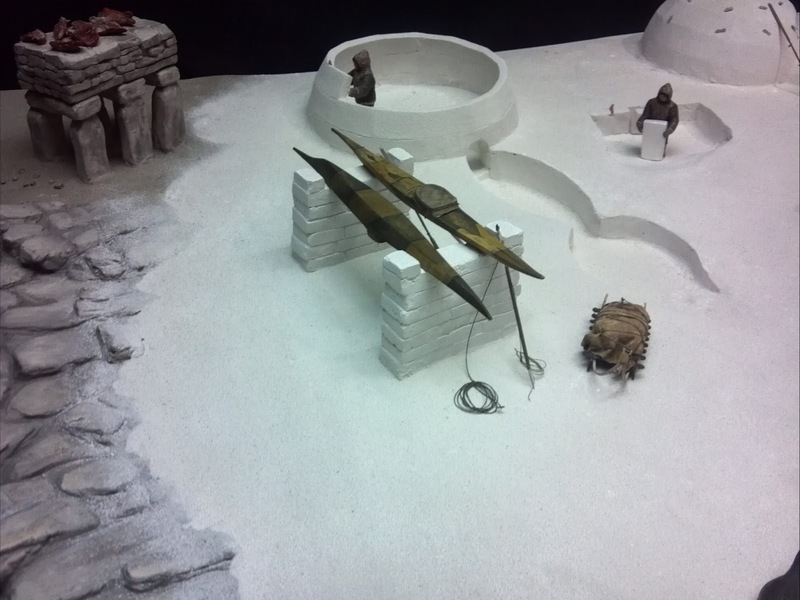 The right side of the diorama shows a different part of the same settlement in winter, with snow on the ground. The pillars on which the kayaks are stored are made of snow blocks here. In addition to protecting them from hungry dogs, this also prevents them from being covered by snow drifts. Left background: meat and blubber storage on a platform of granite blocks. Center background: an igloo under construction. From the display card: "The entryway in the house under construction slopes down gently before abruptly rising into the main vault. This design serves as an effective cold trap for frigid air, enabling the living area to remain warm and comfortable." To that igloo's right, a man cuts blocks of snow for its construction. Care was taken to cut the blocks from drifts that accumulated during a single storm. This ensured that the blocks were of consistent composition, and avoided layered blocks that might split apart when cut. 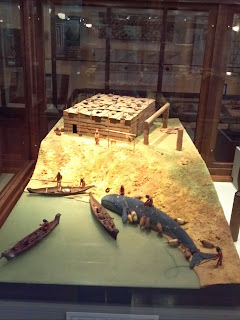 Close-up of the right side of the diorama, with the display card's description: "This structure houses two families who share one entrance. The small protruberances along the entryway are storage rooms for either clothing, spare meat, or blubber. The main vault for these winter quarters could be as much as twelve feet high and twelve to fifteen feet in diameter." The igloos are lined with hide, barely visible around the base of the cutaway structure at right rear. Cords tied to the wooden toggles visible on the exterior of that igloo and the one to its left pass through the snow-block walls to secure the lining. Close-up of the three kayaks on the diorama's right side. The deck gear on the upright kayak includes a sealskin float on the rear deck and, on the foredeck, a shallow, round container that holds the line attached to a harpoon. 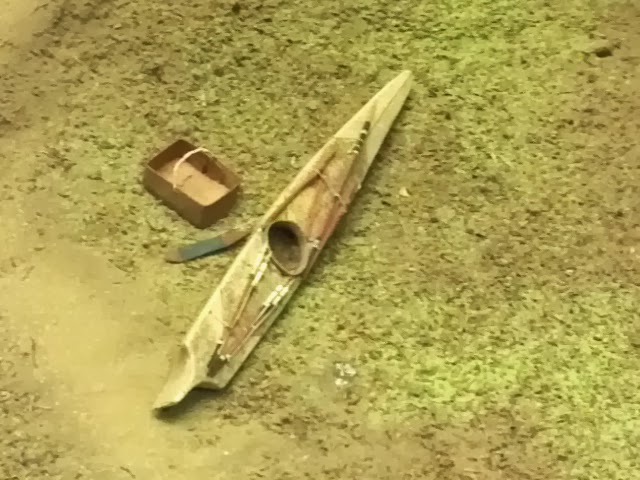 A very long paddle with very narrow blades, apparently tipped with bone or ivory, rests across the bottoms of the other two overturned boats. 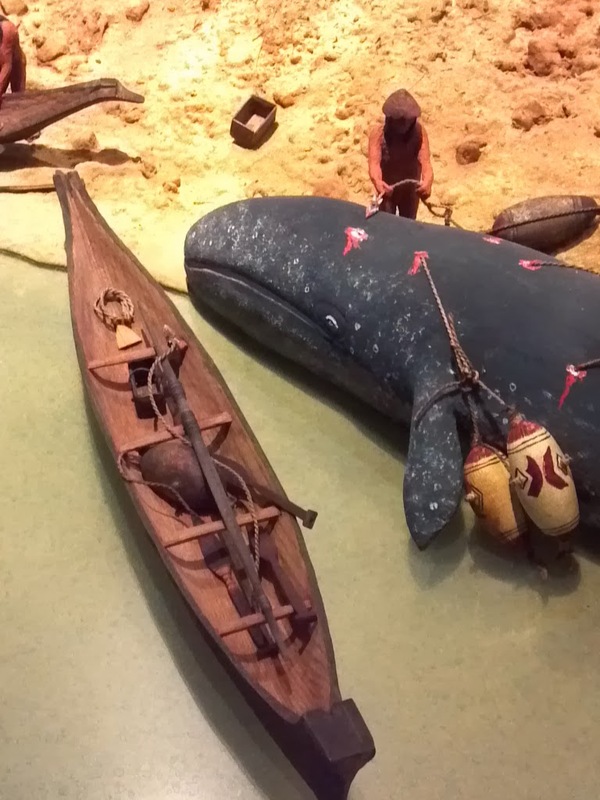 The kayaks in the diorama are similar in many respects to the Baffin Island kayak from Cape Dorset shown in Adney and Chapelle's The Bark Canoes and Skin Boats of North America. The boats' bottoms are flat in transverse section; the back of the cockpit coamings are straight; the aft decks are low and flat; and the stems are extremely raked and very long above the waterline. 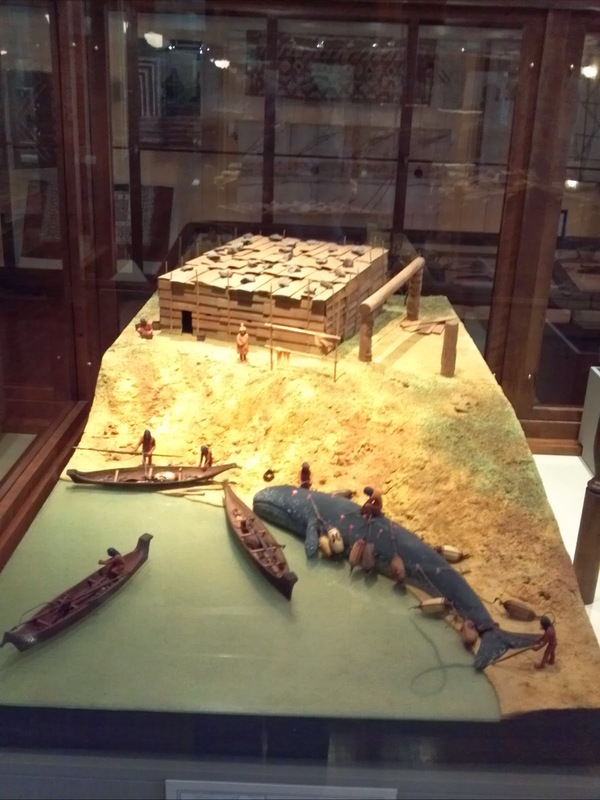 The Peabody Museum houses excellent permanent and temporary exhibits and collections, mostly of American cultures but also including some other parts of the world. It's attached to a museum of natural history that's included in the price of admission, and both are well worth a visit.